Any unwelcome water in your home can be dangerous. A waterlogged house then has the potential for a lethal combination: water damage and electrical wiring. Electrical equipment can be extremely hazardous if re-energized without performing a proper evaluation. Such equipment usually involves switches and low-voltage protective components such as molded-case circuit breakers and fuses. The integrity of the plastic and rubber protective components is critical to the safe operation of circuits; the ability to protect these circuits is decreased with exposure minerals, contaminants, and particles present in the water. Further, some circuit breakers are equipped with electronic trip units, and the functioning of these trip units can be impaired. Everybody’s in a hurry to get things back to normal after a disaster, but safety around water and electricity require patience. Plus, having an undamaged and fully operational electrical system will help you clean up after any flood. You will rely on it to make repairs and return to your property with fewer delays. 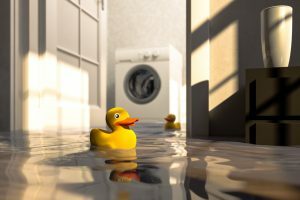 Your initial water damage could cause damage to your electrical system as well as appliances and devices throughout the home if not properly repaired. Damaged wiring may arc or cause power surges that could permanently damage devices plugged into the system. Avoid entering until the utility company, fire department, or a licensed electrician has turned off the electricity fully. Removing the meter from the socket is the only way the house can be completely disconnected from the grid. Even if you’ve lost power, you can still be electrocuted in a flooded basement if someone is running a generator nearby and back-feeding electricity into the damaged electrical grid. Once the building is pumped out and you begin recovery efforts, check all electrical components. For example, a water damage specialist can advise you whether your heating or cooling equipment can be salvaged. It depends upon the type of equipment, the depth of the floodwaters, and the duration of submersion. Pay increased attention to grounding and bonding; ask an electrician to conduct a thorough survey of the system. Not only do you need to inspect the parts designed to carry electrical current during normal operation, but you also need to confirm the ‘grounding’ system is undamaged. In the aftermath of heavy rain, you may note a humming or buzzing sound coming from various wires or appliances. If there is a strange sound, don’t attempt to handle it in any way! This means it’s holding a charge. That charge will shoot into you in a hurry if you get too close. If a buzzing wire is in a pool of water, avoid that too. Water carries a charge readily, and it’s as dangerous as the wire itself. Prevent A Shock To The System AND to YOU! Electricity and water are such a dangerous combination because water is a conductor of electricity. Handling damaged wires or failing to notice electrified tools, equipment, or standing water can send the current through your body. You could wind up with serious injuries. Damaged wiring causes a risk of devastating property fire caused by short circuits in flooded systems. Wires may be exposed and make contacts with unintended, and ungrounded, surfaces. The heat can build up and your material could catch fire. Flood water is typically contaminated with sewage, chemicals, silt, and other debris, which makes the damage worse. Those toxins will affect the performance of any electrical equipment or appliances and will increase the chance that complete installation or replacement needs to take place. And if anything is not cleaned thoroughly, it can cause future corrosion and problems. Additional damage to electrical equipment can also result from flood waters contaminated with chemicals, sewage, oil, and other debris. Ocean water and salt spray can be particularly damaging due to the corrosive and conductive nature of the saltwater residue. The best way to assure you’re entering a safe home is to call water damage professionals with the knowledge needed to assess the damage in the home. During the tour, the electricity should be turned off at the fuse box; damaged appliances should be unplugged and moved away from any area that was affected by the water. For services such as the electricity and the gas, keep them turned off until it’s safe. Water damage shouldn’t be taken lightly and is not a fun do-it-yourself home project. Get an expert opinion to determine if equipment and appliances can be dried out and restored or if new installation must be done. Flood Pro has a 30-year reputation for trusted water damage restoration for protecting homeowners from serious water damage when disaster strikes. If you’re experiencing any type of water damage on your property, call for a home inspection. If a pipe bursts or any other water enters the home, call 24/7 for emergency repairs.